Alumni of Furness College (1986), Barbara Daniels graduated from Lancaster to initially become a secondary school English teacher for 10 years. Whilst teaching she also played cricket as a hobby, to such a standard whereby she was selected to represent the England Women’s team in 1993. Playing for seven years, her illustrious career spanned 70 One Day internationals and 9 Test Match appearances. Touring around the world, Australia through to India, Daniels competed in two World Cups too. An invaluable member of the English Women’s cricket team, Daniels’ most memorable series is thought to be her final number of appearances before retirement, against South Africa. Amassing 230 runs from five matches, to yield an run average of 57, including an innings of 95 at Taunton which proved one of many great innings throughout her career. Considered a top order batsman and handy right arm spin bowler, she also had the leadership skills to merit the vice-captaincy on numerous occasions while playing for England. Her greatest achievement while playing for England came in her first year of competitive action, winning the 1993 World Cup which was held for the first and only time it has been, in England. Featuring in seven of the eight matches Daniels was inside the top 10 of the highest run totals scored in the whole competition. Beating New Zealand in the final comprehensively by 67 runs, Daniels was a part of a strong England side who won the third women’s World Cup comfortably. Taking to either form of cricket Daniels saw success in Test cricket as well as the shorter ODI, evidenced no better than her exquisite batting against New Zealand again, three years after the team’s World Cup success. Her innings of 160 – off 268 deliveries – including 20 boundaries still stands as the fifth highest by an English woman in a Test match and 15th greatest tally of a woman ever. Daniels was a success both on and off the field where she became the first full time Executive Director of the Women’s Cricket Association leading the organisation into a merger when the England and Wales Cricket Board became established in 1998, proving a great influential figure within Women’s cricket. Now a level 4 Cricket Coach which she utilised when coaching the England Women’s Academy for two years, Daniels has since ran her own company which works with educating coaches across a number of sports. Probably the University’s most celebrated sporting alumnus, Jason Queally rode to Olympic glory at the Sydney Olympics in the men’s 1km time trial 14 years ago. Jason, born in Staffordshire, attended Lancaster’s own Royal Grammar school, before going on to study Biological Sciences at the university. A member of Bowland College, Queally graduated in 1992 and while at the university represented British Universities at none other than water polo. Since graduating from Lancaster, he went on to compete in the triathlon before primarily focusing on cycling, which would be his most successful sport. After achieving close to the 1km record, Queally soon turned to cycling full-time in his mid-20s and saw success in the early stages of his career. His most profitable event, the 1km time trial, known colloquially as the ‘kilo’ which is four straight laps around the velodrome, was where Queally went on to win silver medal at the National Track Championships in 1996, beginning a flurry of silver medals in the 1998 Commonwealth Games held in Kuala Lumper and then the Cycling World Championships in Berlin a year later. Those three silver medals in varying competitions, were soon eclipsed on the opening day of the Sydney Olympics where Queally managed to smash his personal best by a second and a half with a time of 1:01.609 setting an Olympic record in his favoured event – which would only be bettered from a Brit by Chris Hoy four years later. Aged 30, Queally entered the event only having cycled three time trials all year, but the underdog came out on top after an anxious wait, to beat the 15 competitive riders before him – including home favourite Shane Kelly who beat him in Malaysia at the Commonwealths two years prior. After his crowning glory, Queally added another silver to his medal collection in the team sprint along side Hoy and Craig MacLean to finish off a dream maiden Olympics for the Lancaster graduate. Since Sydney, Queally saw success in the World Championships again, picking up one Gold, two Silvers and four bronzes over a six year period as well as gaining four silvers in the 2002 and 2006 Commonwealth Games. While Hoy competed in the 1km in Athens, Queally still competed in the team sprint, but Team GB were knocked out by the Germans, who went on to take Gold, despite GB posting the second fastest time of the competition. 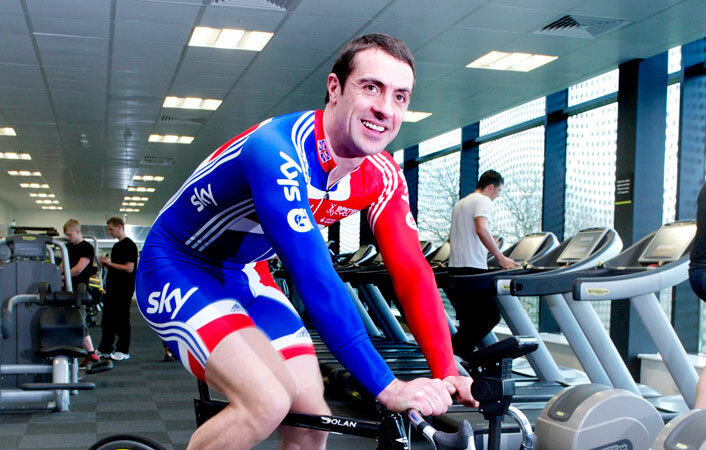 In 2009 Queally was inducted into the British Cycling Hall of Fame and has been cited by London 2012 gold medalist Jason Kenny as a big influence to why he personally took to the velodrome. After retiring initially in 2008, only to come back to compete in the 2010 World Championships, Queally even hoped to qualify for the London Olympics 12 years on from his Olympic swansong, falling short at the final hurdle of qualification. Post-retirement following a remarkable career, Queally still is actively involved in cycling spheres throughout the sport to this day. More recently the English track-cyclist began our weekend Roses celebrations in May, fronting the ‘Roses Ride 2014’ before the day’s competitive action got underway.